Andrew Jackson (March 15, 1767 – June 8, 1845) became a General in the War of 1812 and was considered to be a war hero. He became the seventh President of the United States of America. He was the first Democrat and is on the Twenty Dollar Bill. His nickname was "Old Hickory". He was the first U.S. President who was not born into a rich family. He was not a rich man and did not have a college education. He moved to Tennessee and became a politician. 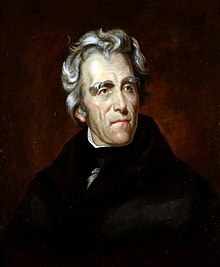 Andrew Jackson was against the national bank of the United States because he felt that banks and their banknotes were for rich and powerful people and did not serve the interests of the common man. The national bank expired during Jackson's Presidency. Jackson chose not to continue the bank. On March 4th, 1837, Andrew Jackson finished his second term. After that, Vice-President Martin Van Buren was elected President and continued many of the things Jackson did. Jackson was a big influence on other Democrats during the 1800s. Jackson's legacy among historians is mixed. Some have liked him because he was against aristocrats, bankers, businessmen, the British Empire, cities, and paper money, and in favor of ordinary country people. Some have disliked him for the same reasons and because he was in favor of war and slavery, and against Indians. This page was last changed on 30 December 2018, at 18:53.